Adapting to LEDs 1: miniature screw bases. It is nearly six months since I last contributed to this blog. I have been busy persuading reluctant chronometers to work properly and writing posts to my chronometer blog at www.chronometerbook.com. This is not to say I have been ignoring sextants and I have two or three restorations to write about, soon, I hope. Incandescent light bulbs are beginning to fade into obsolescence and to be replaced by light emitting diodes (LEDs). At first available only with a rather feeble red light, now a variety of colours, including white, is available at high intensity. Recently, I came into possession of a C Plath professional bubble artificial horizon, my reward for restoring two others to working order. However, mine was lacking a working bulb. Plath sextants lit their readouts using miniature bulbs with screw bases and these are now very hard to find. www.bulbtown.com may have a small supply, but once these are gone I have no idea where others may be had. For this reason, I have looked into adapting the instruments, sextant and its artificial horizon unit, to use LEDs. 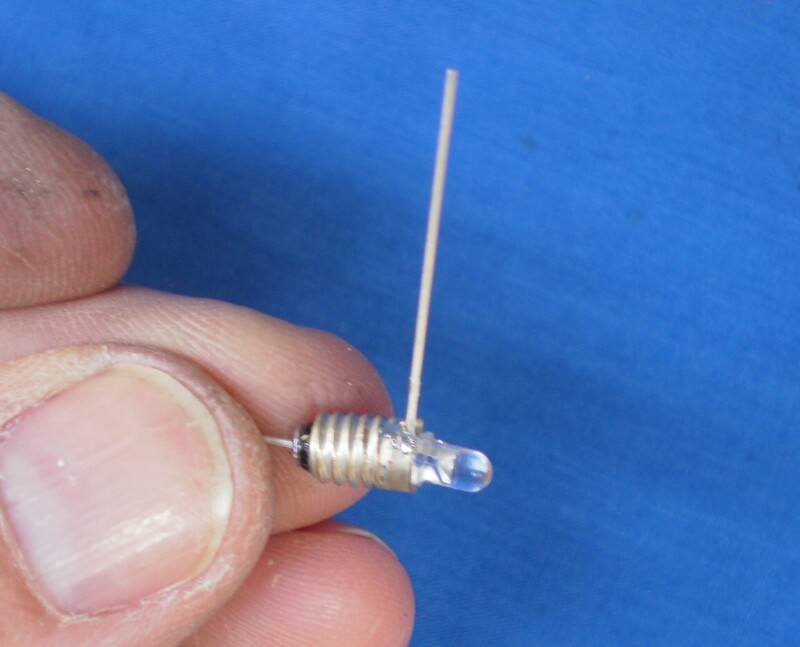 The base of the bulb is 5 mm in diameter, but fortunately 3 mm diameter LEDs are available. To experiment, I bought half a dozen 3 mm LEDs with white output of 4000 mCd (millicandelas) with a supply voltage of 3.6, and with 35 degree angle of radiation rather than the more usual 11 degrees. At full output, 4000mCd is uncomfortably bright and I chose the larger output angle to give a wider and more even area of illumination within the bubble unit. It was also very adequate for the scale illumination. The first step is to salvage the base (Figure 1). Since the bulb was burned out, I grasped it with pliers, intending to crush the glass, but in the event the globe came free intact, except for one of the wires. Figure 1: Removing old globe. 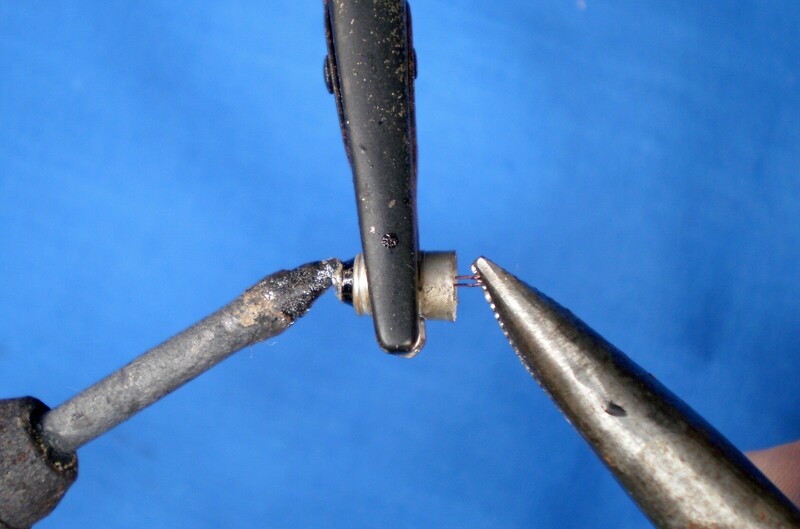 Figure 2 shows the wire remnants being removed with the aid of a soldering iron. To avoid burned fingers, It is helpful to have a third hand in the form of a mounted crocodile clip to hold the base. 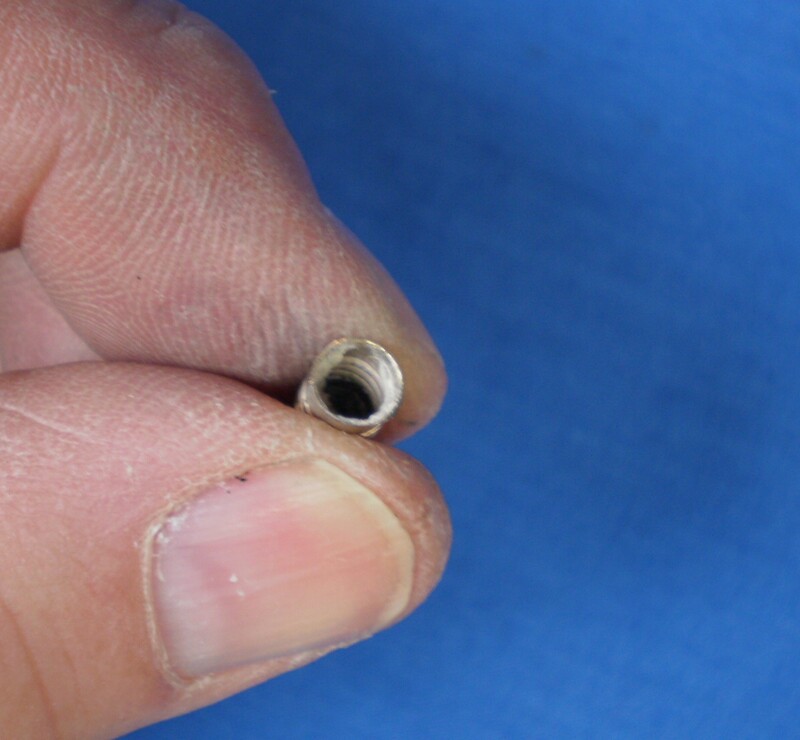 When the central wire has been removed, a quick puff of air while the solder is still molten will leave a hole for the new central wire. Figure 2: Removing remnants of wires. 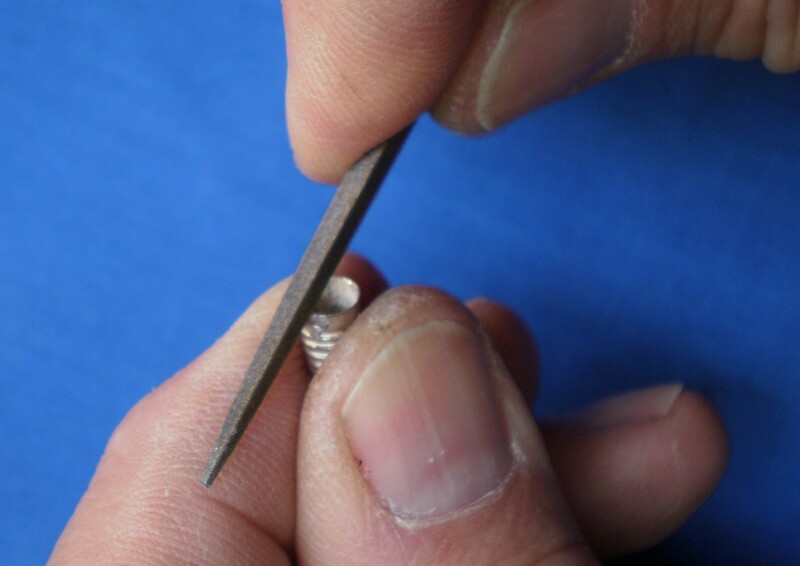 It is then necessary to remove old cement and a scriber, preferably carbide tipped, can be used to chip it away. Figure 3 shows the process complete. A notch must now be filed or sawn into the edge of the base to accept one of the LED wires. Figure 4 shows this being done with a triangular Swiss file, sometimes called a “three-square file” for an unknown reason. A junior hacksaw blade will do the job just as well. Figure 4: Cutting notch for positive wire. 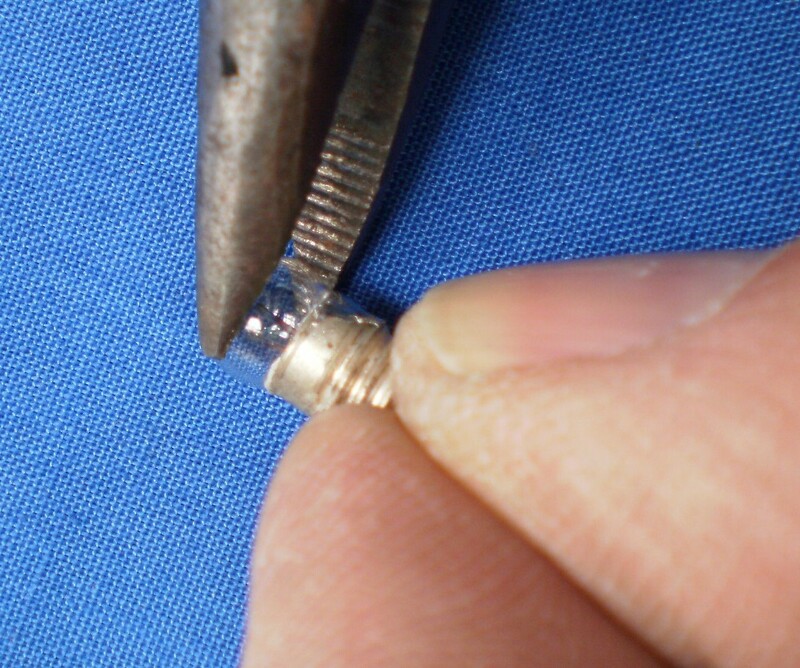 The notch must be deep enough so that when the wire is bent at right angles close up to the base of the LED, that latter will sit just inside the salvaged bulb base. 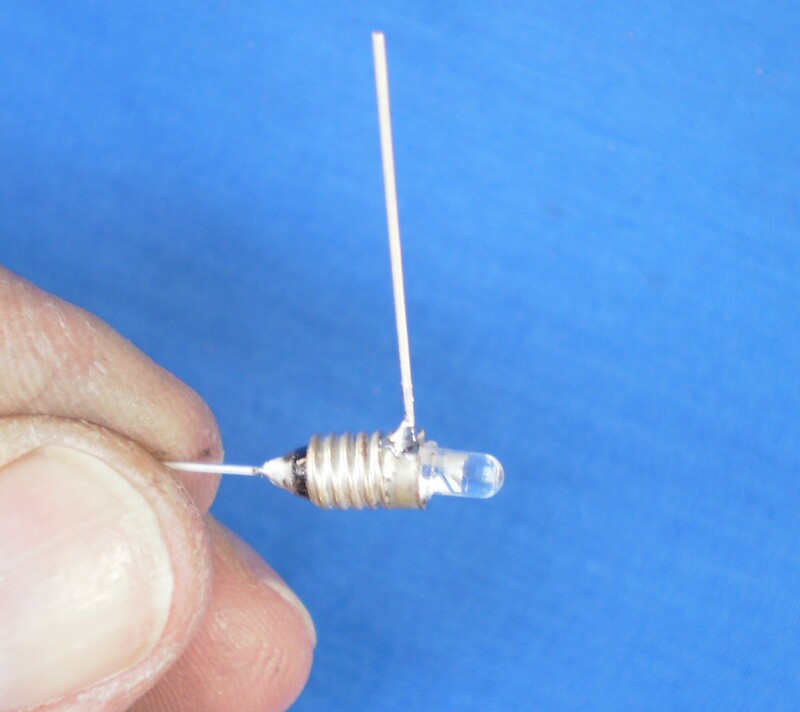 This insures that the tip of the LED will project no more than the original globe (Figure 5). 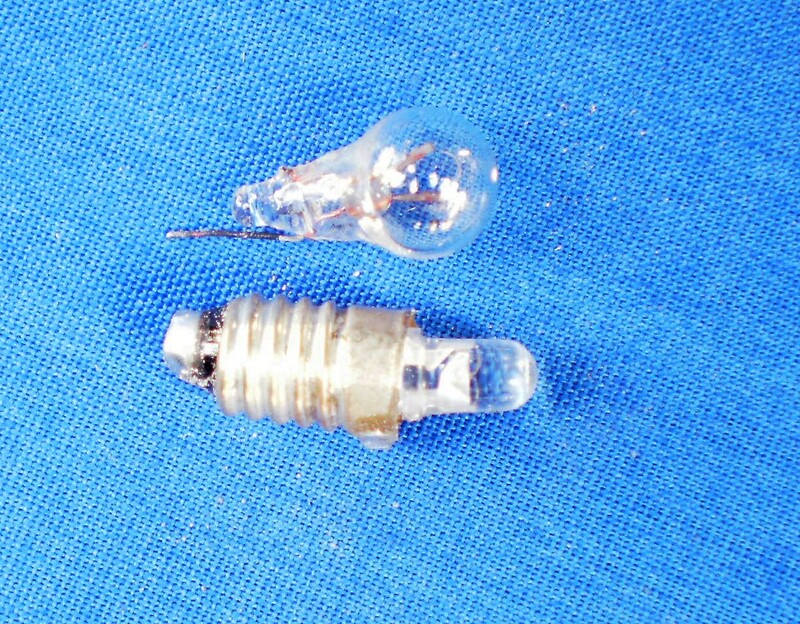 While an incandescent bulb will work whatever the polarity, an LED will not. In my fine old C Plath sextant with the batteries inserted positive upwards, the central contact of the base in the scale lighting is also positive, but in the bubble unit, it is negative, so if you have both, the LED lamps will not be interchangeable. However, since the life of an LED is very long indeed, once fitted, they can be forgotten unless they work loose in their holders. At any rate, the longer lead of the LED is positive. As Figure 5 shows, the correct lead is selected to fit in the notch and the other lead is led straight through the centre. Figure 5: Leads in place. Figure 7: LED adaptation alongside original globe. If, as in Figure 7, the LED is slightly askew, it can easily be persuaded to point in the correct direction. The very cautious may secure it with a blob of Araldite or similar, but the leads anchor it very securely and no further action is really necessary.